You know me by now, I love a good empties post. There’s something so satisfying about finishing a product and being able to chuck it away. Especially when you have a collection of beauty products so large that you could open a boutique. As a blogger, I’m lucky enough to receive many products for the consideration of a review but to be honest, this isn’t the sole reason for my vast amount of products. I can always remember having lots and lots of products from a young age. Now I’m working on using up what I have before buying new and it is working to some extent. Holidays help as I find that I have more time to pamper myself and I take products away with me that are near their end so that I can use them up while I’m away and throw them out. In comparison, when I’m at home, I find that I’ll flit between different products so I end up with lots open at the same time which isn’t a good idea! Today I wanted to share with you some more products that I have used up, this time while I was away in Morocco earlier this summer. Starting with the Manuka Doctor Apiclear Purifying Facial Scrub. You can read a full review of this face scrub in this post. I love the Apiclear line from Manuka Doctor but this isn’t one of my favourite products. I do think that it would be good for those with oily, acne prone skin as it is a little drying and therefore I wouldn’t recommend it for dry skin types. I’ll not be repurchasing it as it isn’t as abrasive as I would like. I love the Goldfadden MD Doctors Scrub which has an amazing microdermabrasion effect. Although it is far more expensive compared to the Manuka Doctor one, it does a much better job at sloughing away the dead skin cells from my face and brightening my complexion. One product that I will repurchase however is the Charles Worthington Volume and Bounce Texturising Spray that I reviewed here. This is a fabulous product that added plenty of volume and texture to my hair while I was away and while I was using it in the weeks leading up to my holiday. It is a great product to take away with me when I travel because I wash my hair everyday on holiday and find that it is so soft and lifeless whereas this gives it a bit of grit and volume. I would totally recommend it! I’d also recommend the two sun tan lotions that I have used up here. The first is the Vichy SPF 50 for the face that I reviewed here. This is a facial SPF that protects the skin from burning while moisturising it and leaving it feeling soft and supple. 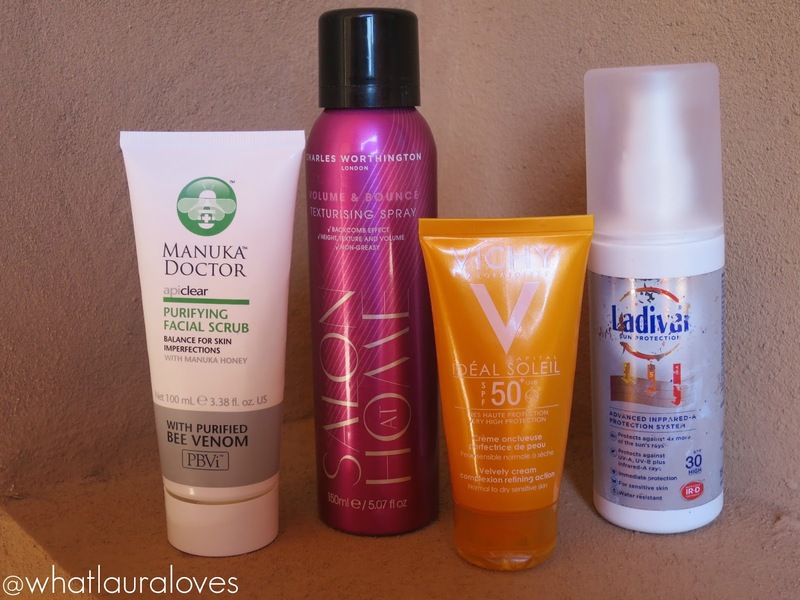 I’d absolutely recommend it, as I also would recommend the Ladival SPF 30 which is an advanced suncream that goes above and beyond normal suncreams to protect the skin against Infrared rays. It is a light lotion that applies effortlessly from a spray bottle and sinks into the skin super quickly. I usually prefer clear SPF products but this product is fabulous. 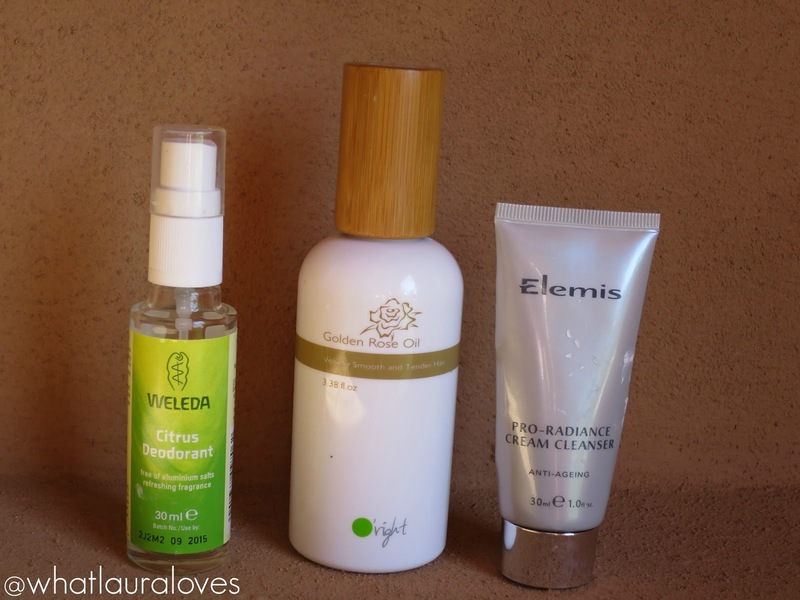 I’d heard that citrus scented products help to keep mosquitos at bay so when choosing my deodorant for my trip, I opted to take the Weleda Citrus Deodorant away with me. It isn’t a fragrance that I would usually go for but for my holiday, it was perfect. So refreshing and zingy, it had a really awakening effect, especially after a long day sunbathing. Why is it that doing nothing is so tiring?! I was almost out of my O’Right Golden Rose Oil before I left for Morocco so although it was a full sized item, I took it with me because I knew I’d be able to use it up while I was away. This is a hair oil that I posted a full review about here. I wont be repurchasing this oil as it didn’t seem to have much of an impact in my hair compared to other hair oils that I have tried. I’ve since been using the Recoffee oil from the same brand and that is far nicer than this one as it makes my hair a lot smoother, silkier and gives it a healthy sheen. The last product that I used up on holiday in Morocco was the Elemis Pro-Radiance Cream Cleanser. This was a deluxe sample that I got in a gift with purchase when I bought a couple of products at the spa of the hotel where I got married. I love cream cleansers and this one is fabulous at removing my makeup and cleaning my skin without drying it out. I’ve already bought the full size of this cleanser (see this haul post) and although I haven’t had a chance to use it yet because I’m making my way through one that I already have open, I am looking forward to using it and seeing the impact on my skin over a longer period of time. So that’s it for my Moroccan holiday empties. You can see the other post that I put together with more products that I used up while I was away here. I’m sad to see them go but I’ve been making my way through SO many products since and I can’t wait to share them all with you in another empties post. I’m thinking about filming it just to get them all out of the way as I literally have a HUGE bag full! You did a great job finishing up lots of good stuff! I have heard lots of good things about Elemis products. I need to try something from that brand. I bet the citrus deodorant smells like a dream. Also, I love ANYTHING from Elemis. That stuff is sooooo good! Great post.